Make your reading nook a mini library by installing shelves for books, good overhead lighting, and painting the interior and trim a warm color. Check out how to build a classic floor-to-ceiling bookcase. Utilize the space under the basement stairs for a quiet reading nook perfect for escaping people running though the house upstairs. Check out how to finish a basement so you can enjoy that nook the comfiest way possible. For a reading nook that’s perfect for chilling out your child, construct a colorful wood half arch that tucks perfectly against a wall. String some lights inside, lay down a furry blanket and voila! If you’re intrigued by secret hiding places, check out this ultimate guide to secret hiding places in your home. Let your child move while they read by installing a hanging wicker or wrought iron pendant swing from the ceiling. Check out these 10 pretty porch swings for more inspiration! 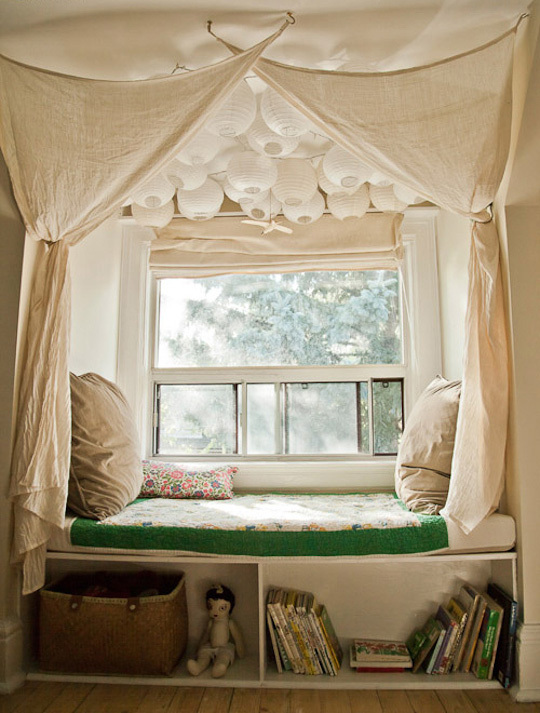 Great for children, get creative with your reading nook with a plush seat that just so happens to be installed in the wall! It’s a dramatic statement when no one is in there, and a perfect place to curl up once your little one gets inside. Another way to liven up your wall is to learn how to create a subtly dimensional accent wall.